I don’t really have a lot to say about this recipe, except that it’s good. It came together because I was reading an old magazine over coffee a few mornings ago. I like to do that on occasion – read old magazines for inspiration. I don’t mean ancient – just a few years old. One of my professors at NSCAD used to say: If you want old ideas look in new books; if you want new ideas look in old books." It’s fun to look back with 20/20 sight to judge the trends magazines espouse, and see if they were correct or just blowing so much smoke up our skirts. Most “latest, hottest” ideas tend to be of the same variety as Pantone’s Spring colours. Remember that post/rant by me just a few days ago? I don’t think much of expert pronouncements from sources you know just want to influence us and/or peddle us something. I have an interesting way to use the entertainment I get from these old magazines. I don’t write down the recipes. I remember just the main, important parts (or try to…) and use them as a basis. That’s where today’s recipe came from. It’s certainly not the same as what I saw. I remember something in the recipe about a lemon sauce, but it sounded like maybe a little too much work, and a bit weird. But the rest seemed like a real winner, and simple to boot. 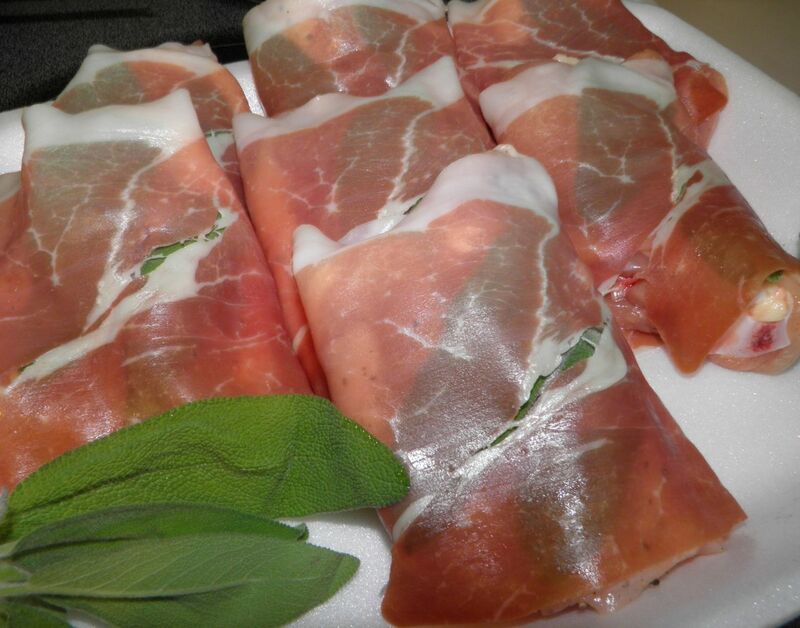 Chicken with whole sage leaves wrapped in delicious prosciutto was pretty much it. I happened to have chicken. There’s a sale this week at the Superstore. Pre-packaged chicken thighs are on for $5.00. Usually the same size packages are about twice that much. Of course the prosciutto negated any savings the chicken gave me (expensive stuff). Perhaps I should learn how to make it. One last point. 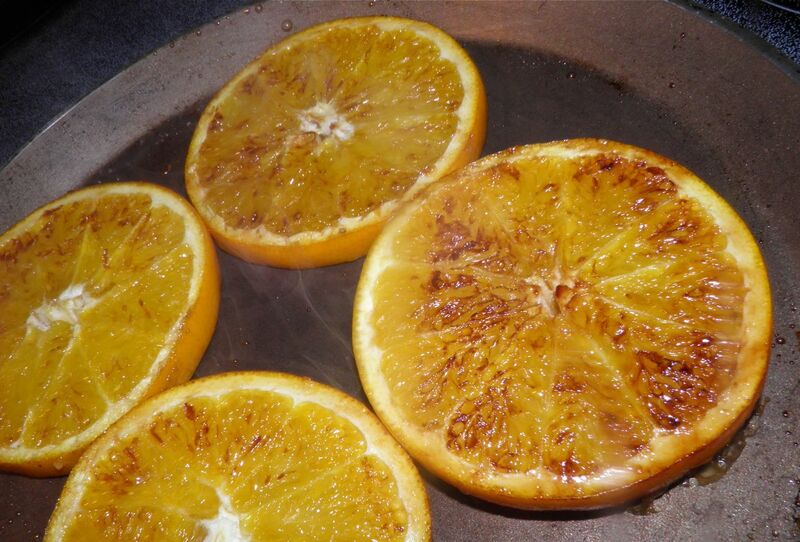 I chose to caramelize orange slices to substitute for the lemon sauce. It was a good choice. Orange goes well with the chicken, sage and prosciutto anf it looked nice too. If I was asked to change anything I might say rub the chicken breasts with a little Dijon mustard before wrapping. If you can get your hands on some chicken, give this recipe a try. It’s quite interesting and tasty. Preheat the oven to 350°F. Remove the skin from the chicken thighs. Place two sage leaves in the centre of each slice of prosciutto. Sprinkle the surface of each with pepper. 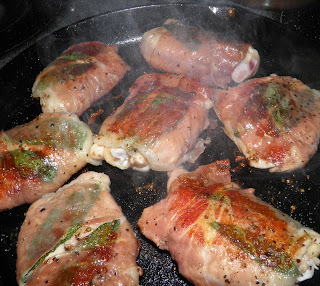 Place a chicken thigh over the sage leaves. Bring the edges of the prosciutto up over the chicken to make a packet. Melt a little vegetable oil in an oven proof pan. Season the outside of the packets with salt and pepper. Cook each chicken package for about 3 minutes per side, starting sage side up and finishing by flipping back to sage side up. Place the chicken in the oven and bake for about 30 minutes, or until internal temperature reads 180°F. While the chicken cooks, cut two firm large oranges into eight 1/4” slices. Sprinkle with a little sugar and caramelize both sides in a hot frying pan. 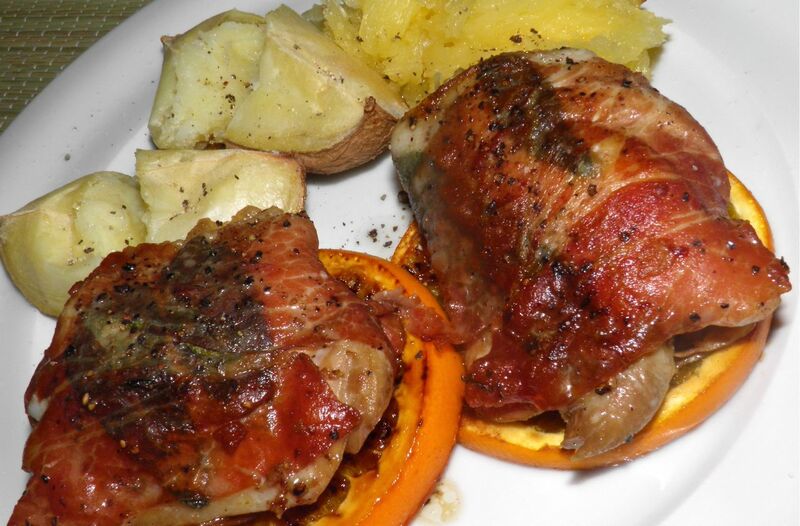 Serve each chicken piece on top of an orange slice.